Re: Re: Re: Burmese White-Heart Beads? -- lindabd Post Reply Edit Forum Where am I? Thank you for posting the new photo with a scale device (coin). It is very unlikely these beads are anything except Venetian beads. Probably trade beads (if they are more than 70 years old). This photo is harvested from a Net article I posted in 2001, based on a Bead Society of Greater Washington Newsletter essay I presented in 1997. I first addressed the issue of the origin of cdA beads at Bead Expo in 1994. 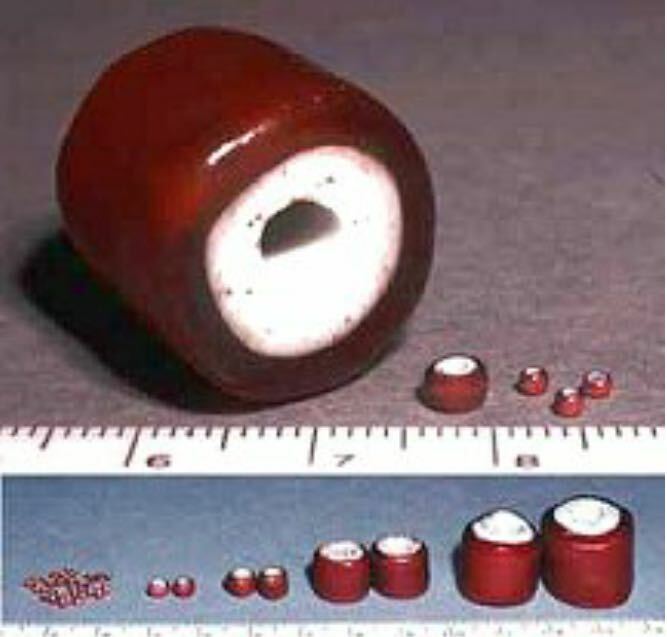 The photo shows the range of sizes, from the largest to the smallest Venetian red white-heart beads I have documented. The normal-small beads are totally congruent with your beads. Whether one writes "Burmese white-heart beads," or "Burma white-heart beads," the concept is entirely context-driven. The beads are only that if they are in or derived from a Burmese necklace. Anyone using these names as some sort of generic is kidding himself/herself, and is misinformed. Since I have not run into this issue before now, I remain surprised—if this has become "a thing."